I was a little bit late to see Catching Fire, second movie in The Hunger Games saga, but I finally caught it this past weekend. I was deeply curious about this one, and hopeful–in a way. If you recall my reviews of the books, I liked the first one only to be disappointed by the second and, to a much greater extent, the third. However–while I’m normally against Hollywood making big changes when they adapt a novel, in this particular case, I suspected that they might choose to change things in a way that I would end up liking much better…and so far Catching Fire seems to be bearing that out. Catching Fire continues the story of Katniss Everdeen (Jennifer Lawrence), who survived the deadly arena of the Hunger Games in part by selling the Capital on her tragic love story with fellow Tribute, Peeta Mellark (Josh Hutcherson). Sinister President Snow (Donald Sutherland) doesn’t buy it, and warns Katniss that any wrong move from her will be a danger to her family. In truth Katniss is torn between Peeta and her best friend, Gale (Liam Hemsworth), and terrified by the rumbles of uprisings throughout the districts, from people who are looking to her to be a symbol. Danger becomes more immediate when special rules are announced for this year’s Hunger Games–past Victors will be returned to the Arena, meaning Katniss and Peeta will have to face 22 particularly smart and deadly opponents. Long plot summary, because there’s a lot going on! 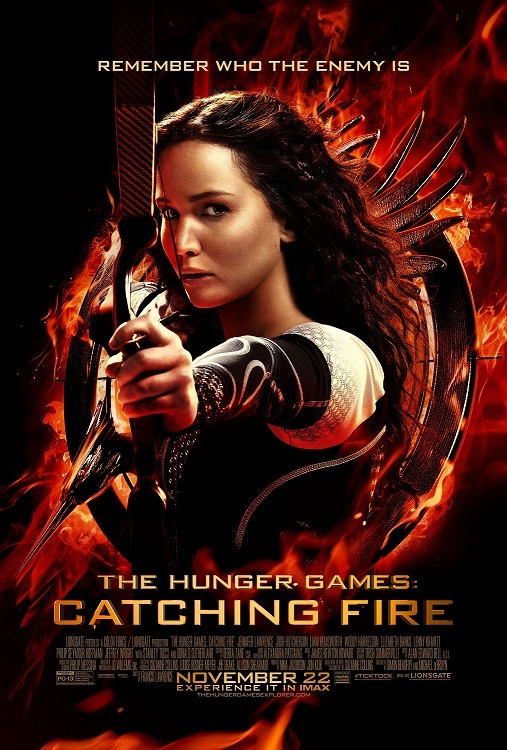 The movie manages a nice balance, though, between all the many crises pulling at Katniss. In some ways she becomes reactive, confronting each crisis (whether it’s Gale kissing her or a crowd shouting) as it comes–but it’s a thinking reactive, where I get the sense that she’s trying her best to deal with everything. It’s so overwhelming that she has to confront each item as it comes. The romantic triangle went a touch differently too; where in the book she simply didn’t seem able to feel anything definite about Gale or Peeta, the movie emphasizes that she’s too scared and overwhelmed to think about romance (very reasonably so!! ), only to realize in key moments of crisis that she may care too much about both guys. The movie also balances the romance well, in that it didn’t feel like a distraction from the larger life-and-death questions. As Casablanca puts it, “it doesn’t take much to see that the problems of three little people don’t amount to a hill of beans in this crazy world.” Except they do, when you might be about to lose one of those people. Gale was in the movie only briefly, but somehow emerged better than he did in the book. Peeta, on the other hand, didn’t do much in this one even though he was in it more. He’s clearly struggling with having stronger feelings for Katniss than she has for him, and beyond that, I didn’t get much of a feel for him at all. Some of the supporting characters, though, were wonderful! Crazy Effie Trinket (Elizabeth Banks), with her ridiculous outfits and superficial concerns, actually won me over. Especially when she talks about how she, Peeta, Katniss and Haymitch are a team. Effie really is superficial, but somewhere under there she has a good heart. Haymitch (Woody Harrelson) was great as well, still a cynical drunk but showing strength and insight too. And Stanley Tucci as Caesar Flickerman was once again absolute perfection–a beaming, shining picture of a game show host, laughing and enthusiastic and so, so unflinching as he talks about death and murder as though it’s entertainment. Rue, even though she died in the last installment, was still such a heartbreaking presence in this one. The most wrenching moment was when Katniss is in Rue’s district, speaking about what Rue meant to her. I love that the three-fingered salute becomes a symbol of the revolution. Alongside Rue, this Hunger Games gives us Mags (Lynn Cohen), an old woman Haymitch describes as a wonderful lady. Katniss has some lovely sweet moments with Mags, which I think do a lot to soften some of Katniss’ more hard-edged, survivalist moments in other places. Great review Cheryl. I really enjoyed this film and look forward to more to come (even though the third book was the weakest for me). I haven’t seen this one yet but will do soon! It’s been getting good review. I thought the first film was a little slow in comparison to the book and I didn’t think that the actual ‘games’ themselves came across as strongly as I thought they should. It will be interesting to see how they portray the third book. It was my least favourite of the series. Nice review, glad that you found this one more enjoyable. I haven’t read the books but have enjoyed talking to my wife about them in relation to the films. You pretty much hit on all the points I liked about this film with the exception of where you compared it to the books. I have to say that I agree with your feelings about this Katniss in that I like that she seems to be struggling with her decisions, which makes perfect sense for a person her age, period, let alone one in such awful circumstances. I’m very curious where they will take the story with the final two films, just sorry we have to wait so long to find out.